The realization that many greentech startups need more capital and time than expected to commercialize their technologies has sacked some venture capitalists’ enthusiasm for cleantech. 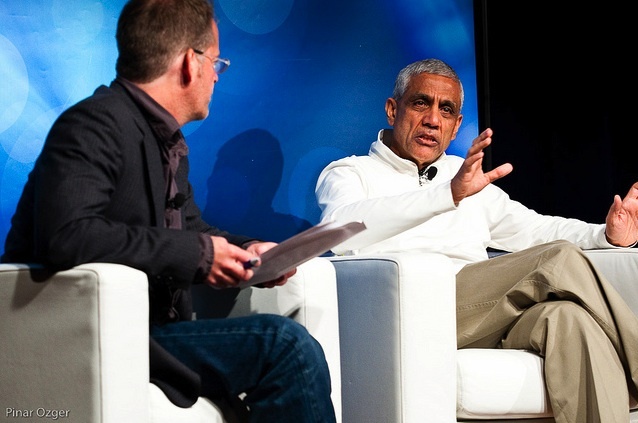 Vinod Khosla has a message for them: chin up! There’s good money to be made and I’m doing just fine, thank you very much. Khosla said his investment firm’s biofuel portfolio contains about $1 billion in “liquid profits” – those are tradable, public shares – thanks to several companies that have gone public over the past year. Thiel, who made his name as a PayPal co-founder and investor, said at a tech event earlier this month that clean energy and transportation investments have been a big failure so far. Khosla has faced criticism for his numerous bets on biofuel companies. The biofuel industry, like some other cleantech sectors, have experienced tough times in recent years as many companies dealt with technology development hurdles or tried to raise money to build refineries when private capital was hard to find. The federal government has lent some big help with loans and loan guarantees from the U.S. Departments of Energy and Agriculture, and some of Khosla Ventures’ companies have benefited. Starting last year, several of Khosla’s biofuel startups began to file for IPOs. Since then, some of them have made their public debut, such as Amyris (s AMRS), Gevo (s GEVO) and KiOR (s KIOR). Mascoma filed to go public about two weeks ago and aims to raise $100 million. Khosla held up KiOR as a case study for success during his talk. KiOR priced its shares at the lower end before the IPO, and its shares closed flat after first days’ trading. KiOR’s shares have moved up in recent weeks, and the company has roughly a $2 billion in market capitalization. The company’s technology converts biomass into a substitute for crude oil, and it raised money to build a second processing plant. A few of Khosla’s companies haven’t fared as well. Khosla will tell you that he expects many startups to fail, and failure is an ingredient for eventual success. As Robert Rapier explained in the article linked above, Thiel’s and Khosla’s disagreement wasn’t actually a disagreement at all. It’s just a case of the media being unable (or unwilling) to identify the fact that they are basing their statements on two different metrics. Thiel is looking at the fact that the world is still highly dependent on fossil fuels, while Khosla is looking at his success in venture investment returns. Both are right. And its time we start paying more attention to Thiel’s metric. Perhaps Thiel framed his message a little harshly, though, and we should absorb his comments as a galvanizing force for more, not less, investment in the space. I guess we can all extrapolate what Thiel was trying to say. I don’t think he was just talking about whether clean energy investments have made a big difference in people’s lives. He’s an investor looking at whether clean tech has made an impact, and he thinks it hasn’t because there hasn’t been many successful (profitable) companies. There is a clear connection between a company’s ability to make money and the social impact it can make.